The swiftwater is rushing by, as you enjoy this luxury townhome. 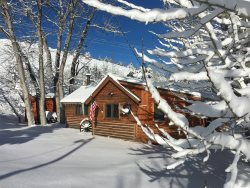 WiFi, hot tub, dog friendly, A/C, garage, walk to downtown, close to skiing this one's for you! Look no further than this for your ultimate vacation home! Occupying the end site at the Island at Rock Creek, with breathtaking mountain views, a 5 minute walk from town center, you'll discover Swiftwater, a real gem which looks straight down onto Rock Creek. Because of it's corner site the accent is on light and tranquility. In fact, you will go to sleep and wake up to the relaxing sound of the Creek on its journey from mountains to ocean. This luxury property is high spec from top to bottom. The spacious creek side deck has a large hot tub, is a great spot to barbecue, has WiFi internet service and a 27 inch TV. Downstairs, the open plan living area simply has everything you could want of a holiday home with superb furnishings, artwork by local artists and a gas fireplace. The bedroom downstairs has a comfy queen bed, half bath/shower room across the hall. Upstairs you'll find two luxurious king suites each with a balcony facing the creek and en suite facilities. There is a further loft area which sleeps 2 in a sofa sleeper. To the side, Swiftwater is surrounded by well maintained lawns and gardens. Extras this home has: Charcoal BBQ, Front Porch, 2 Gas Fireplaces, 26 inch Cable TV, Deck on the Creek, Downtown Location and on the end of the Townhomes. They were always prompt with everything. Zero complaints. I will come back and I will use you again absolutely. The experience I have working with the team is non evasive. Most of our contact is through emails. I get the call about 1-2 weeks before our reservation date to confirm. This is our 5th year in a row that we have stayed at the same property. We like having the same condo each year. It is like going home. It is always as expected. The location to down town is great. Even with a band playing 4 blocks away the soothing sound of rushing water from Rock Creek drowns out the background noise. Love it! "Amazing Condo This condo was great! Very spacious, large rooms, great back patio overlooking the river. " "Relaxing in the beauty that surrounded us! Very nice and clean. " "Great house and great location Wonderful home with great space for 8 people. 2 suite rooms were spacey. 3 blocks down town was walkable. I spent wish the TV was bigger. Great views of creek . " "Wonderful...again This was our second Christmas at the Swiftwater and we loved it. My favorite spot is still the hot tub outside! Part of the family went skiing and enjoyed it. There is enough room for everyone, great decor, everything you need in a beautiful setting. It's a great place to spend quiet time with the family, play games and relax! I would recommend this to anyone! " "wonderful The staff were extremely accomodating. The location and amenities were exceptional. We would go back. " "Beautiful Property We enjoyed everything about this property. The location is just 3 blocks from downtown, the hot tub creekside was delightful, the unit is properly appointed. Very responsive attention from rent management company. We would certainly stay again as we did like this very much. The only negatives we had was only 1 TV and it was small. In fact while trying to watch the world series, the screen wasn't large enough for us to the see the score box. A few other things that would make this property even better is higher end of wine glasses, i.e. appropriate for red vs. white., many light bulbs were burned out and the batteries in the remotes for the fireplaces were all dead. Response ""We are happy you enjoyed your stay at Swiftwater. Thank you for letting us know about the bulbs, batteries and suggestions for TV and wine glasses. Please know during your stay if you call, we are happy to replace bulbs and batteries and any time. We will also put in a request for the TV and wine glasses. We hope you will stay with us again. AAA Red Lodge Rentals team."" "
"Perfect property for a small town get away We had a fabulous time at the Swiftwater home. In the mornings, we had coffee in the hot tub and watched the deer walk by and listened to the river below. The house was clean and spacious. We took our dogs for walks in the nearby hills (across the street) and through the downtown area (just a couple blocks away). This is a very pet friendly town! AAA Rentals was quick to respond to my emails and very friendly and helpful. The only 'complaints' from our group were the TV was a little small for the liking of the Saturday college football crowd and the lighting over the table was a little harsh and caused a glare on the puzzle we worked on. Overall, just wonderful. We couldn't have been happier. " "Perfect location. Beautiful place Enjoyed walks to town (3 blocks). River right out the back door, very calming. Drove Beartooth Pass, people in town were very nice. The only thing wrong with the condo was the glass on both sides of the front door need some kind of privacy film or curtains on them and the windows (bottom sides) going upstairs. A lot of walkers going by. Response We are happy you enjoyed you stay in the Swiftwater condo. Thank you for your feedback and we will be happy to make a request for the curtains. " "Fantastic! We really enjoyed staying at Swiftwater this last weekend. Although we have stayed in these condos before, it was once again a very nice stay. We really enjoy the convenience of how close it is to downtown, but also the quietness in the evening. Most of all we enjoy the sound of the creek running through back of the condo. Rental agency is wonderful to work with. "